Having a routine eye exam is the best way to maintain healthy eyes and vision throughout your lifetime. 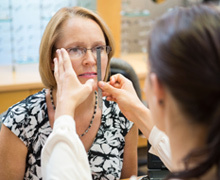 Many systemic and eye conditions will progress through several stages before they can affect your eyesight. Treatments are much more effective when conditions are detected earlier. With retinal photography and imaging, we are able to screen for early signs of retinopathy. When diagnosed early, various advanced treatments will be available to help manage these ocular and systemic conditions. This is an advanced procedure utilizing a highly specialized retina camera to detect diabetes, hypertension, age-related macular degeneration, glaucoma, retinal holes or detachments and more. Are you considering LASIK surgery? If so, you have come to the right place. Our LASIK consultations are always FREE. Give us a call today to schedule your FREE LASIK consultation and complimentary refractive surgery screening.